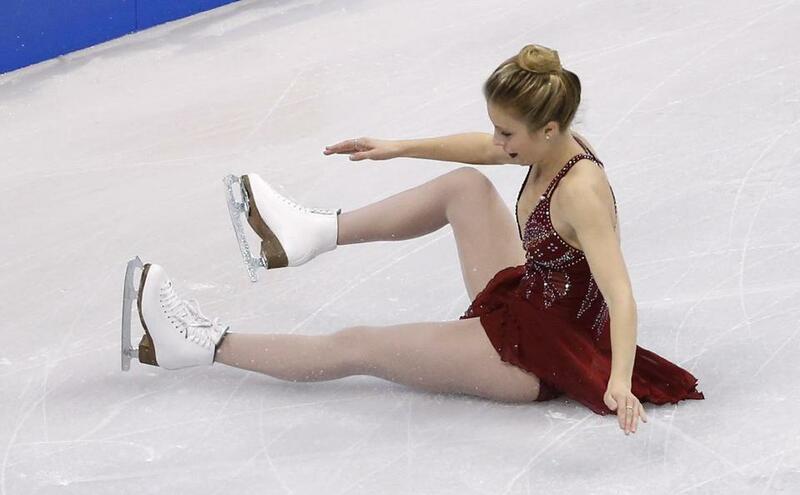 Ashley Wagner fell twice in Saturday night’s free skate at the US championships at TD Garden. They followed their process. That’s why Ashley Wagner, who fell twice in Saturday night’s free skate at the US championships at TD Garden, was named to the Olympic figure skating team for next month’s Sochi Games and why Mirai Nagasu, who had her best skate in years and earned the bronze medal, was left off. “This is not the only event that US Figure Skating considers in selecting the team,” president Patricia St. Peter said after the team was announced at noon on Sunday. Wagner had won the previous two US titles, which no woman had managed since Michelle Kwan in 2005. She had placed fifth at the global championships, helping the Americans earn back a third Olympic entry. She had won medals at both of this season’s Grand Prix events and collected bronze at last month’s final. According to the process she was the top pick, without question. But when her time came to affirm her primacy, Wagner collapsed. After finishing fourth in Thursday’s short program she fell on two triple jumps, just as she did last year, and ended up fifth in the free skate. It was an “embarrassing” outing, said Wagner, and it left her sobbing and shell-shocked. “I was terrified that I was going to have something to regret,” she said. Then came Nagasu, who has been a loose wire for her entire career. Her placements at the national championships have been all over the chart: 1-5-2-3-7-7-3. Last year, after placing third in the short, Nagasu came 11th in the long. “It’s been quite a roller-coaster ride since the last Olympic nationals,” she acknowledged. That probably was what kept Nagasu from a return trip. The selectors had no clue about which Mirai would show up in Sochi. They had a decidedly better idea about Wagner. “I’m happy that my federation was able to see beyond one bad skate,” she said. It was the first time that the USFSA had bumped a medalist except for injured previous champions, which happened three times. In 1992 Mark Mitchell was bypassed for Todd Eldredge, who won two titles and a world medal but withdrew from nationals with a bad back. In 1994, when Nancy Kerrigan couldn’t compete after thugs linked to Tonya Harding assaulted her, Michelle Kwan was displaced after Kerrigan showed that her knee could hold up at the Olympics. When Kwan, an eight-time champion, couldn’t skate because of a groin injury, Emily Hughes missed out, although she got to compete when Kwan withdrew at the Games. The Russian federation will make its choices after this week’s European championships. They’ll either pick Evgeni Plushenko, the 31-year old former champion with the 71-year-old back, or Maxim Kovtun, the 18-year old who beat Plushenko at this month’s nationals. What’s all but certain, though, is that the Russian federation will consider this month’s results as paramount. The USFSA does not. Only one of the four disciplines — the dance — was clear-cut. Meryl Davis-Charlie White, Madison Chock-Evan Bates, and Maia and Alex Shibutani were 1-2-3 both last season and this time. No other couple could make a case for Olympus. That wasn’t true about the other events. Caydee Denney and John Coughlin, who’d won the 2012 pairs crown but missed last year’s nationals in the wake of his hip surgery, won Saturday’s free skate to finish only 29-hundredths of a point behind Felicia Zhang and Nathan Bartholomay. Had they had results from last year, Denney and Coughlin might well have been given the nod. What made the choice easier was that Coughlin singled three consecutive double jumps in the long program that cost him and Denney second place. Even after Jeremy Abbott hung on to win his fourth title on Sunday afternoon despite losing the long program, the selectors faced a dilemma — did they award the second spot to Jason Brown, just up from juniors, or to Max Aaron, last year’s champion? Had Aaron had a better season — he didn’t qualify for the Grand Prix final and was seventh in the Tokyo event — he might have been tapped. But Brown, who’d won a Paris medal, clinched his ticket by winning the free skate here and placing second. Aaron, who was 10 points behind him, had little more than one great night a year ago to recommend him. Wagner is going to Sochi because her body of work was convincing. But she knows that millions of her countrymen — and the thousands in the Garden who gave a sobbing Nagasu a standing ovation when she came out for Sunday night’s traditional show skate — don’t understand why.